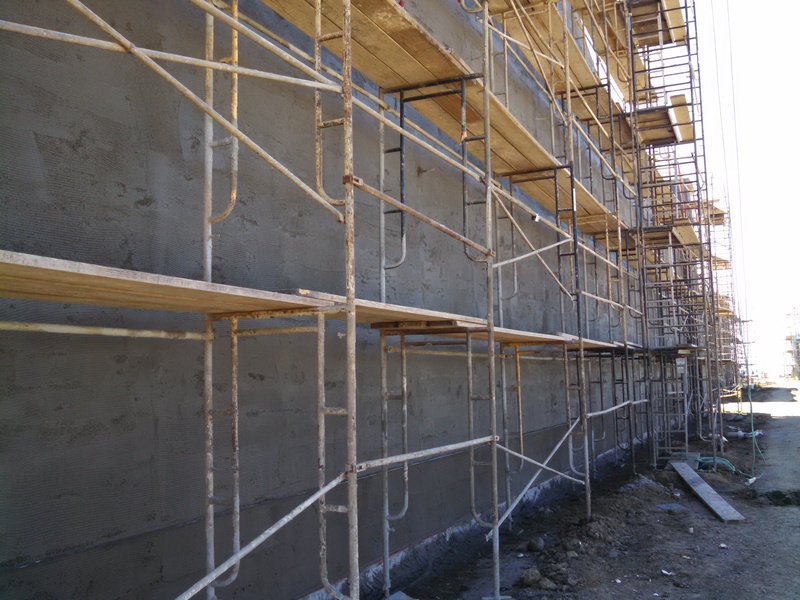 I spent a day with the Brady Company on the job in San Clemente last week, and their professionalism and attention to detail renewed my faith in the stucco industry. They were applying the scratch coat to the first building of an outlet mall to beat all outlet malls. This one is perched atop a hilltop in the most charming beach town in Southern California, and has Pacific Ocean views to go with the great shopping. They are pumping our Sanded Insulex product as their scratch and brown coats, made with washed clean silica sand, factory blended so it’s the same ratio every time. 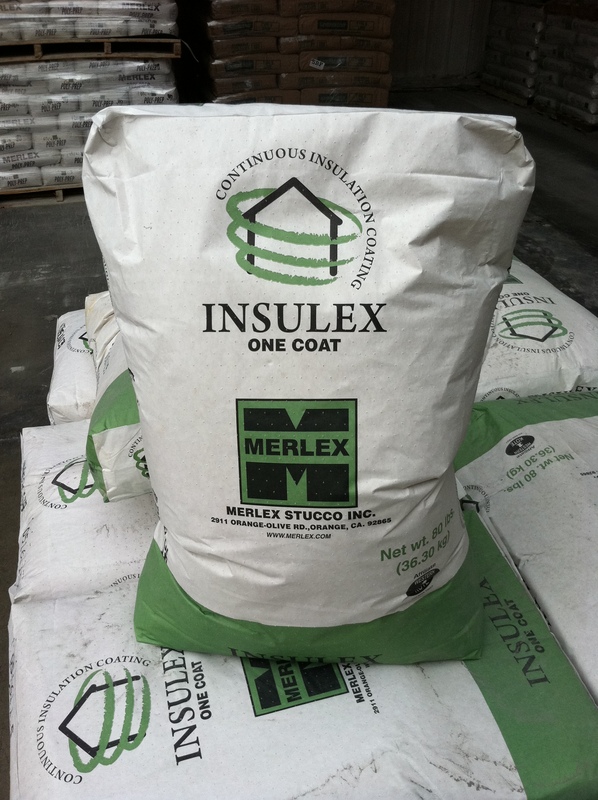 Insulex is blended with fibers for improved strength and sag resistance allowing for accelerated job scheduling due to reduced wait times between plaster base coats. Our flexible polymer-modified, crack-reduction system (Basex) is then being applied as the base coat, specifically designed for smooth coat finishes. 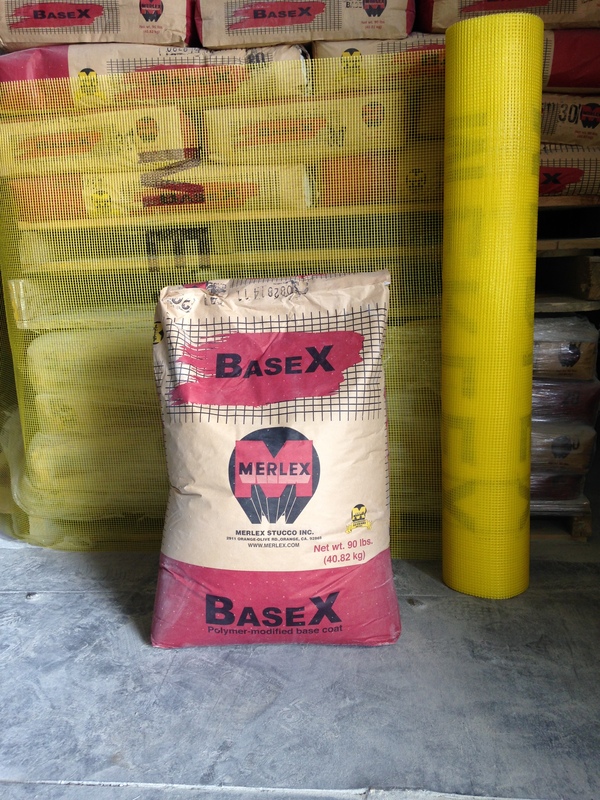 One of the key advantages of using our base and mesh system (Basex) is the fact it withstands cracks in the base coat up to 0.04 inches without cracking through the finish coat. 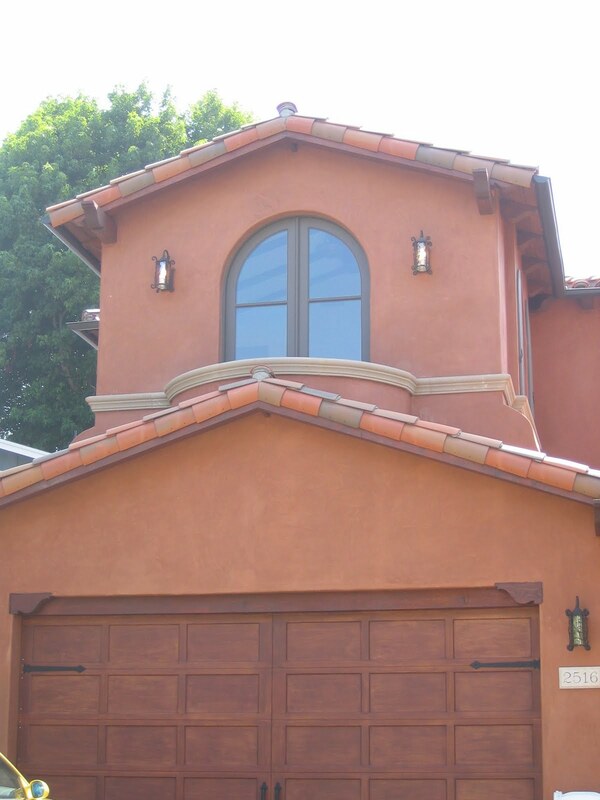 Lastly, Brady will apply our Merlex Santa Barbara Finish smooth-troweled stucco as the finish coat. These guys from Brady are pros. The mixers, Ernesto and Ismael, followed our mixing procedures to the letter and stopped the mixer after a few minutes to break the set. Not many crews follow that instruction, although it’s on every one of our technical data sheets and gives the plaster better workability and open time. I saw Ernesto checking the slump of the material before sending it to the Tommy Gun several times. The hose crew was just as good. Joe ran the nozzle this day to set the tone for his guys, who were hustling to move the hose, trowel out the scratch coat, and keep the trims clean. They worked calmly and efficiently and together, communicating with each other to ensure they did the best job possible. The nozzle and mixer talked frequently by walkie-talkie to ensure proper speed, coordinate breaks and lunch, and fine tune things. 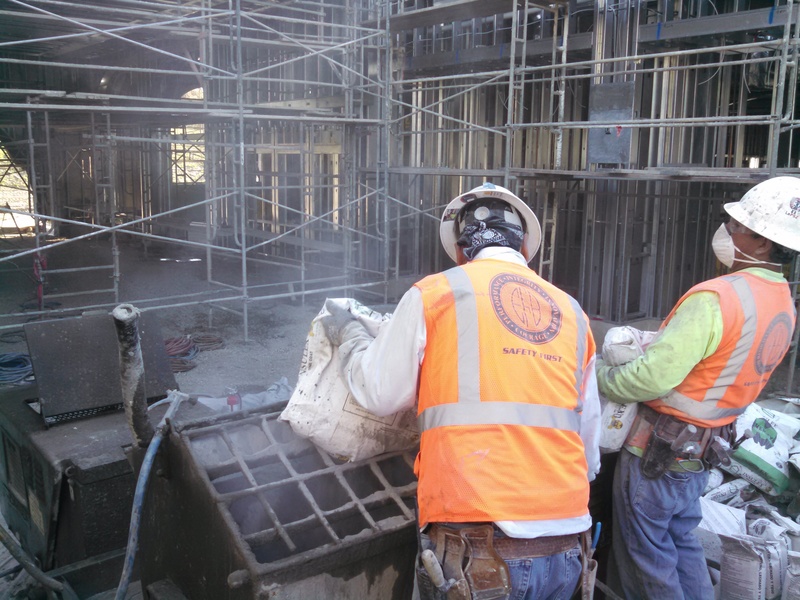 Chuck Cannon, their plaster superintendent, did his part to ensure their success, adjusting the hose configuration, reminding the guys of standard operating procedures and safety issues, and getting the right people in the right places. 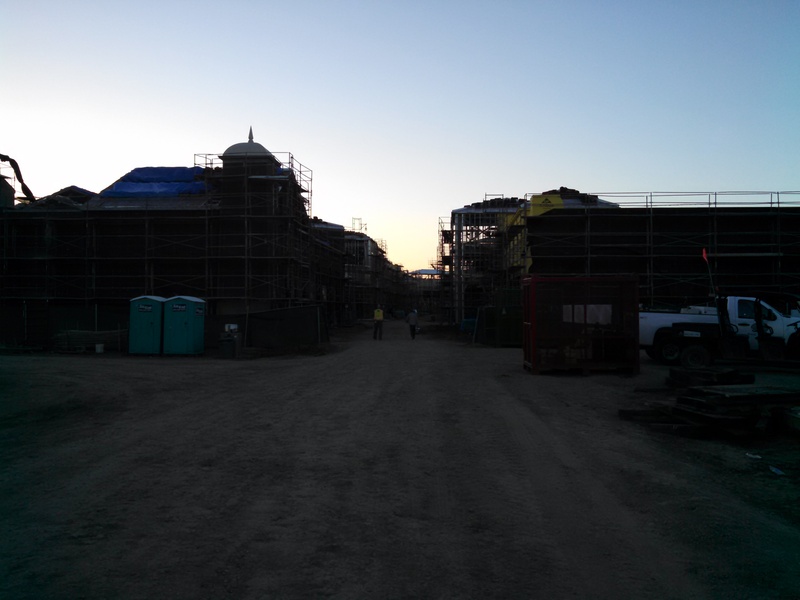 This is the first time I’ve blogged about a work crew. But these guys made me believe that our products are in good hands out there, and that our industry can be successful in rising to any challenge that comes our way in the field. Pigments are expensive and when you get over a pound the price goes up? This is true. 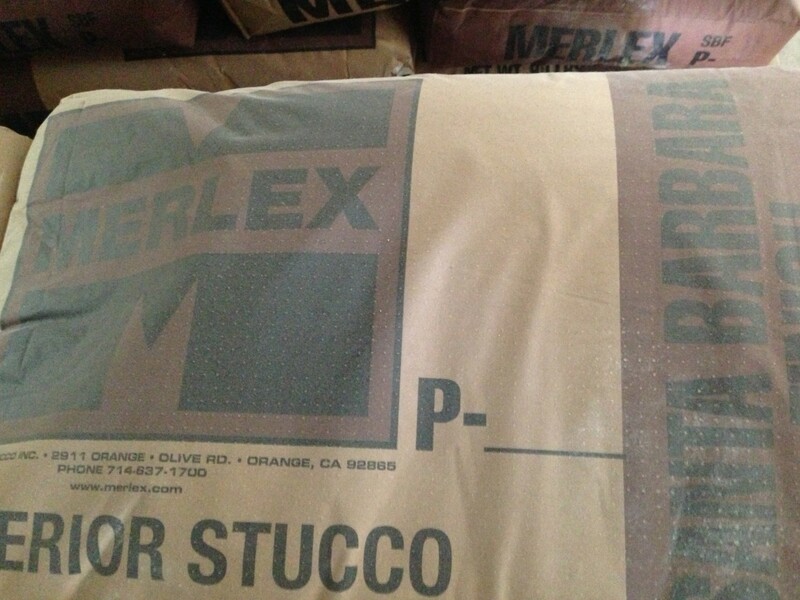 Typically manufacturers allow one pound of pigment in a sack of stucco with no extra charge. Blue and Green are the exception as they are more expensive colors. Pigment is by far the highest cost raw material in stucco by weight. When custom homes want that rich earth tone with four pounds of color it can be as much as twenty dollars extra per sack. Remember though, if we are talking about a high end custom home then the homeowner should get what they want for an exterior color. A very large custom home might use 100 sacks of stucco and even at 20 dollars this is only 2000 dollars more. The contractor says he has a hard time making stucco even and consistent with heavily pigmented colors? This also is true. However keep in mind what texture is wanted. A lace texture or sand finish is very unsightly with mottled color. In this case the wall would certainly have to be fogged to even out the color. In smooth finish applications color mottling is typically required. With darker colors we see movement and character in the stucco. It becomes a benefit and part of the artistic beauty of the finish. Are some colors so dark that fog coat cannot be produced for that color? This is a common assumption and most stucco manufacturer s have specified limits to making fog coat with over 4lbs of pigment. The reason is that fog-coat comes in a 25lb bag. If there are 5 lbs of color in the bag that constitutes 20% of the bag by weight. 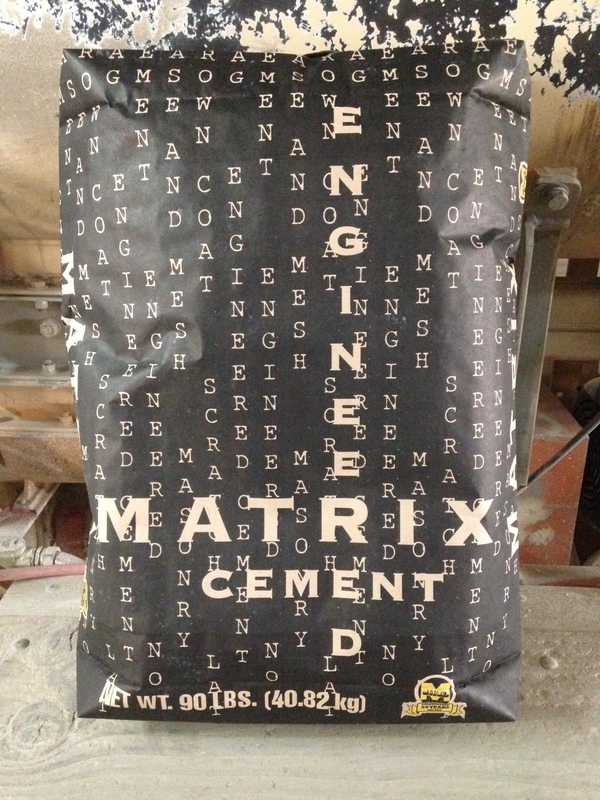 We cannot take that much cement and other ingredients out of the bag to accommodate this much color. 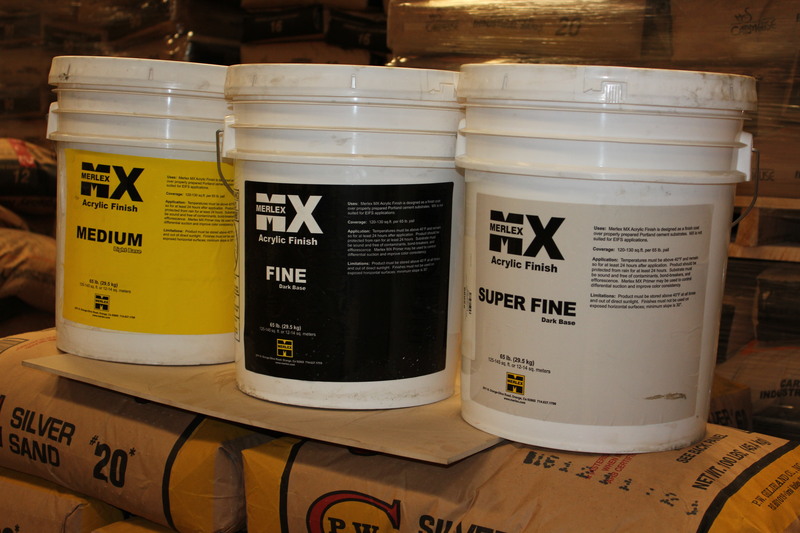 Similarly, we cannot produce heavily pigmented pre-mix stucco for the same reason. We never want to put so much color in the bag that it threatens the integrity of the product. We should be able to produce fogcoat that can even out color variances using dark pigments. The solution then is to make fog-coat in base and color and let the contractor mix it in the field. Are colors more “problematic” when they are dark? Yes, stucco is certainly not paint. It is not logical to expect stucco to react as paint does. Weather plays a huge part in how stucco looks and the more pigment involved the more the weather and other variables can affect color. 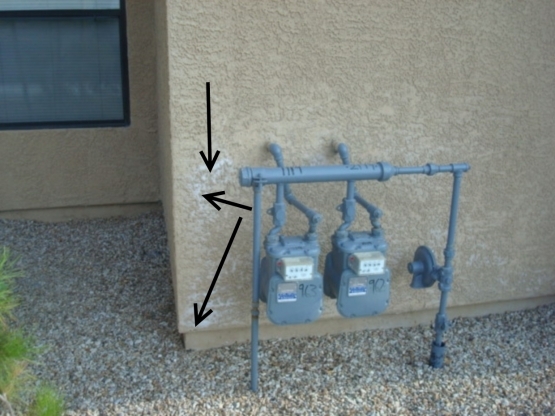 Efflorescence is more noticeable in darker colors. It is not because there is a higher presence of salts, it is that salts are white by nature and show much more on darker walls. Always do a mock-up and agree on the color before starting the job. Discuss mottling, efflorescence, extra cost and find the tolerances and expectations of both parties and put it in writing! Discuss what to do in the event of freak storms, repairs resulting from damage by other trades and who will pay for these issues. Weigh the pros and cons very carefully when choosing color. Remember, stucco is by nature a natural product. All the raw materials are from the earth and it is almost always hand applied. This is the beauty of the product. We don’t have to re-do it every few years like paint. Stucco has an extremely long life cycle. So like any natural product or handmade material certain allowances must be made for the very nature of the product. Life is a give and take so go for that dark color on a smooth wall! Enjoy the beauty of the staining and mottling the same way you would admire your handmade antiques with all of their beautiful imperfections! Merlex representatives are fielding an increasing number of questions about how to build energy-efficient stucco walls. These systems have existed for decades, but are getting a boost from the California Title 24 energy efficiency standards that went into effect on July 1, 2014. How can I use stucco over “CI” (continuous insulation) foam board? Will CI stucco systems (a.k.a. 1-coat stucco) be less durable than traditional 3-coat stucco? Is there a cost difference between 3-coat and 1-coat stucco? 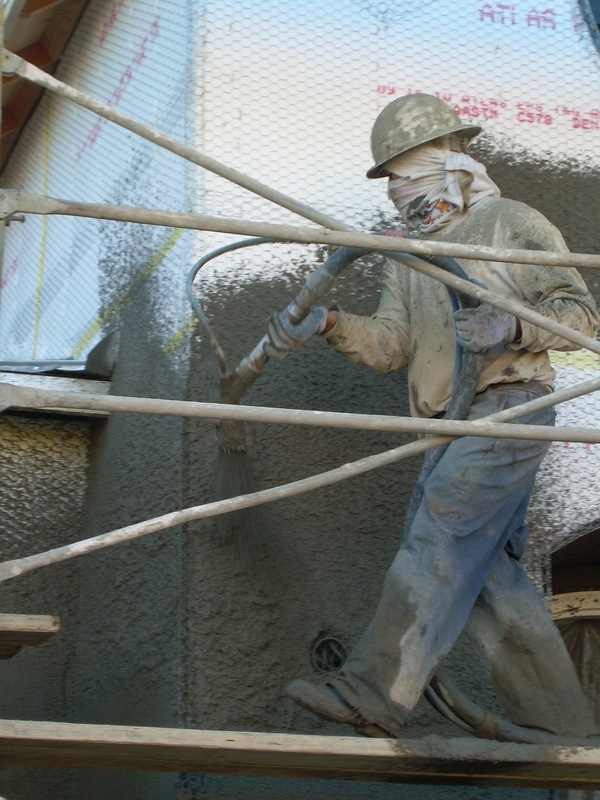 Are contractors in California trained to properly apply 1-coat stucco? Does 1-coat stucco have a strong “bang for the buck”? That is, will 1-coat stucco cut energy usage significantly more than all other design alternatives with the same cost? Can 1-coat stucco go over open framing? Does 1-coat stucco have a fire rating? 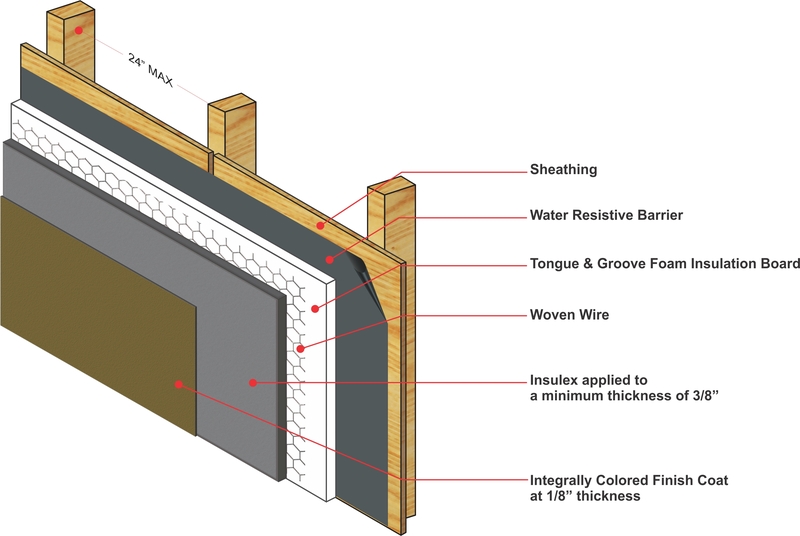 What if we combine 1-coat stucco with other siding materials and there are different cladding thicknesses on the wall? What if the foam board fasteners miss the studs? What happens to windows and accessories like weep screeds when the thickness of the stucco increases? What alternatives are there to 1-coat stucco if I decide not to use it? Merlex’s President and Vice President are touring the State right now with an informative presentation on this subject, and would welcome the chance to present to architects and builders interested in these and other questions. 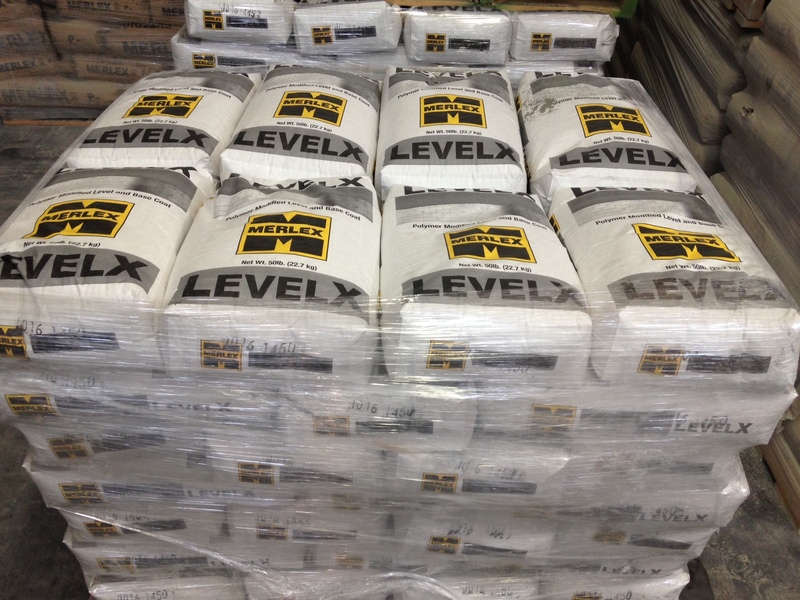 The industry needs to learn more about 1-coat stucco, such as Merlex Insulex, and what it can do to help them build more energy-efficient buildings.